i think this is the last scrap of the red polka dotted paper left on my desk--unless there's a really really small one hiding in the little pile! as soon as i saw the cps #20 sketch, i knew i had a home for it and a beginning for my card. the base is a pale blue arturo notecard from ellen hutson's online store, stamped with a swirl from autumn leaves swirls v. 2 by rhonna farrer. the star is from su! onboard accents, painted white and covered in glitter. i punched a hole in the center with my crop-a-dile to pull the ribbon through to tie. the ribbon is from my older stash--probably from michael's. 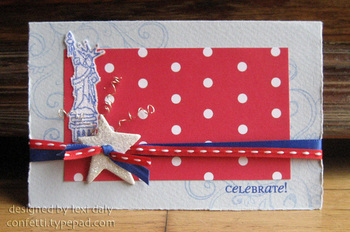 i put the same ribbon in my girls' pony tails yesterday morning for red, white & blue day at camp and immediately thought of this card--it was coming together perfectly in my head before i even touched the supplies! i also really wanted to use a muse's lady liberty after buying her in ny. she was the hardest to place, but eventually i decided to make a little grouping for her with the star and a few springy wires shooting from it. like the star, she's also completely covered in glitter--sparkle, sparkle and more sparkle! and the sentiment is from little lady by papertrey ink. lots of different companies represented here! here's something a little different for me lately. i wanted to create something for cps #19 this week, but just hadn't gotten to it--then they posted a color challenge, which kicked me into gear, i guess. this card incorporates both. for the color challenge, they posted a picture of a red and cream room with touches of khaki. the sketch also inspired me to pull some design elements from the picture too--the clean lines are a nod to the chair and bed skirt and the paper piercing is to mimic the edging on the sheets. 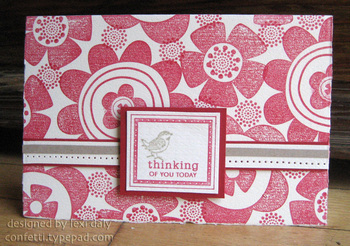 i love a change in style every now and then, especially when it makes me use stamps i haven't used much lately!